Search Results for "ice cream time lapse"
Time lapse. Waffle ice cream bowls with scoops of ice cream on a pink background. Timelapse of chocolate sauce being poured over an ice cream cone with it dripping down and collecting in the plate. Making summertime gourmet berry and vanilla ice cream sundae time lapse. Making summertime gourmet chocolate cherry and coconut ice cream sundae time lapse. Time lapse. Waffle ice cream cones with plate of ice cream scoops on a plate. 4k Summertime pink ice cream cones decorated with candy and fruit, melting in the heat, time lapse. Time lapse. Melting ice cream. Variety of metal ice cream scoops with different ice cream and toppings on pink background. Time lapse. Vanilla and strawberry ice cream scoops with chocolate drizzle and waffle in paper cup. Time lapse. Chocolate ice cream scoops in paper cup. Time lapse. Chocolate ice cream scoops with waffle and sprinkles in paper cup. Time lapse. Vanilla and lime ice cream scoops with chocolate topping in a white cup. Time lapse. Grilled organic peaches and pecans over vanilla ice cream. Time-lapse. Making kiwi coconut chia popsicles in frozen ice pop maker. Time-lapse. Ingredients for making fresh fruit popsicles with apple juice. Time lapse shot of ice cream in a cone with sprinkles melting and dripping down. 4k Chocolate gourmet ice creams decorated with macaroon berries and fruit against green screen, melting in heat, timelapse. The timelapse shooting of the unrecognised person putting ice-cream cones in the conveyor. HD. The ice-cream cones are filled with ice-cream. Close-up. HD. 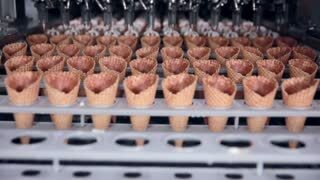 The process of the ice-cream cones put in to conveyor by worker. No face. HD. 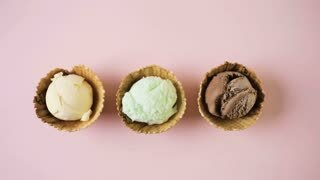 Detailed shooting of the ice-cream cones filling. HD.